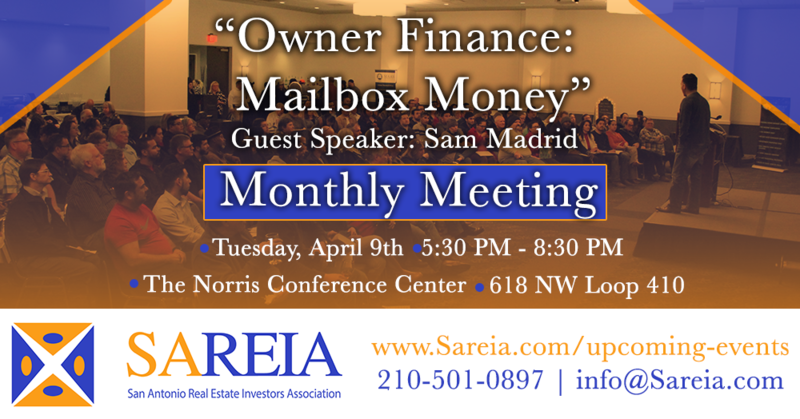 Real Estate attorney, investor, broker and president of SAREIA, Victor Maas & Sam Madrid will be discussing creative investing with owner financing.. As many of you know, Victor has been investing in Real Estate over 14 years. In addition, Victor has closed 100's of transactions ranging from Sub-2 deeds to full blown rehabs. Victor prides himself on being a problem solver and gets creative on even the seemingly impossible deals. Sam is a big proponent of putting money in your pocket when you buy and when you sell. Borrow an extra $2,000 up front and obtain a $3,000 down payment from your buyer. This way you make money upfront, when you resell it, and every month through cash flow. There are more real estate deals out there to be done if you just know where to look, how to look, and what to do once you find it. Victor and Sam will be talking about this at this month's meeting.